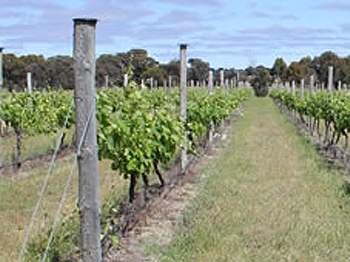 The Lewis Road vineyard is situated fifteen kilometres north of Heathcote, off the Northern highway. 6 acres of Shiraz was planted in 2001 incorporating Mt Langhi Ghiran & PT 123 shiraz clones, 2 acres of Viognier was planted in 2006 & 5 acres of Sangiovese was planted in 2008. The soils vary from red rocky clay to red brown loam. The vines are cane pruned hard to 12-14 buds utilising vertical shoot position (VSP) trellising. Mostly organic viticulture using chicken manure , fish & seaweed fertilisers, limited protective sprays of copper & sulphur and limited irrigation. The aim is to produce high quality fruit capturing the regional characteristics. The uniqueness not only comes from the famed Heathcote terrior but our east west row orientation which tends to slow ripening down as the fruit is shaded for more of the day. Harvest is generally one to two weeks behind other vineyards in close proximity. Our Kyneton/Redesdale Road vineyard is situated on the picturesque Wild Duck Creek 5 kms south west of Heathcote on the Heathcote Kyneton Road. 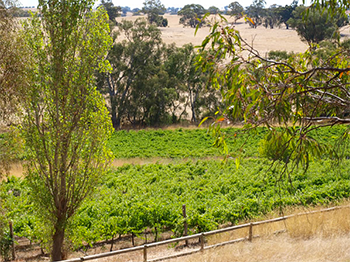 The 4 acre shiraz vineyard was planted in 1990 on a mix of soils from granitic rocky clay to sandy loams. These old vines have produced some stunning wines in the past. Traditionally, the vines have been spur pruned however we are slowly converting to cane pruning to further enhance the fruit quality. The vineyard is managed organically with natural fertilisers and limited copper and sulphur sprays and limited irrigation. The slightly cooler climate at Wild Duck Creek results in a later ripening than Lewis Rd, which will provide the opportunity to blend these two distinct Heathcote terriors. Our winery and cellar door overlooking the picturesque Wild Duck Creek is open for tastings 11am to 5pm Saturday, Sunday and public holidays. Other times by appointment. 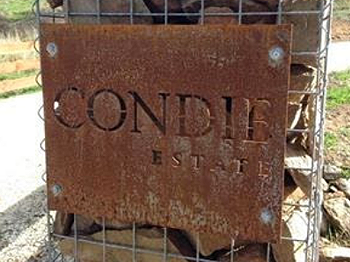 You can find Condie Estate Cellar Door & Winery at 480 Heathcote-Redesdale Rd, Heathcote VIC 3523. Copyright © 2016 Condie Estate. All rights reserved. Website by Studio Ink.